In Hansel and Gretel, a witch kidnaps two abandoned children and plans to eat them. In Freddy and Mrs Goodwich, another witch’s stomach grumbles, but this one wants only for the young child to teach her how to make his delicious pancakes. In this book Mrs. Goodwich loves Freddy's pancakes so much that she takes him with her to her house so he can teach how how to make them too! Hansel and Gretel is a scary tale for kids in fact, it scared me so much as a child I have a feel of something touching my ears at night because my book shows the witch leaning over Hansel and it looks like she is touching his ear. So now at 48 I need to keep my ears covered at night. Why did people think these nursery rhymes were OK for kids? Anyway...Freddy gets the OK from his mom to fly with Mrs. Goodwich. We never do see a Mr. but we have to assume she is married due to the Mrs. While at her tiny egg colored home Freddy finds out why Mrs. Goodwich never can make pancakes as good as he does. With some minor training and some soap and water, Mrs. Goodwich can now make pancakes almost as good as Freddy. This is a much cuter, funnier book than Hansel and Gretel and now I am craving pancakes. 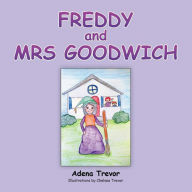 Author: Adena Travors mother used to tell her the story of a boy named Freddy who made wonderful pancakes. Adena's granddaughter is the illustrator.